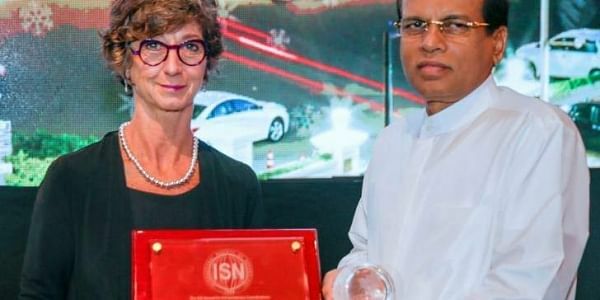 COLOMBO: The International Society of Nephrologists (ISN) has conferred on Sri Lankan President Maithripala Sirisena an award for his “extraordinary contribution” to the fight against Chronic Kidney Disease of Unknown Etiology (CKDu). The award was given by the ISN President, Prof.Adeera Levin, at a function held here on Monday, to launch the ISN-Gardiner Fund (ISN-GF) meant to fight CKDu in Sri Lanka, the region, and the world at large. The Gardiner Fund (GF) is a Sri Lankan fund initiated by Sanjeev Gardnier, the well known entrepreneur and proprietor of the iconic Galle Face Hotel in Colombo. GF is deeply involved in the prevention and treatment of CKDu. Last year, President Sirisena had appointed Gardiner as the Ambassador for the fight against CKDU. ISN President Levin said that this is the first time that the ISN is giving an award to a Head of State. The Sri Lankan National Program against CKDu is the first national level program in the world. It has distinguished itself by making rapid progress in a short time, Levin added. The Sri Lankan model emphasizes not only treatment but prevention, care of patients and their families, research and education. The program is coordinated and led by a Presidential Task Force. Breaking away from past practice, President Sirisena has included the private sector by motivating leading entrepreneur Sanjeev Gardiner to join it and making him the “Ambassador” of the national program. In his remarks ,Gardiner recalled how President Sirisena gently persuaded him to join the program. “The President put no pressure on me. He just asked me to come to the affected areas and see the peoples’ suffering for myself. I was moved by what I saw,” Gardiner said. The 46 year old Gardiner thereupon set up the Gardiner Fund with a personal contribution of LKR 30 million .It is setting up Reverse Osmosis (RO) plants in the affected areas for people to drink purified water as impure water is said to be one of the causes of CKDu. Accepting the award, Sirisena said that CKDu is endemic among poor farmers in 11 districts and villages under 60 Divisional Secretariats in Sri Lanka. There are 20,828 patients and 5000 deaths per year. “It is a national disaster” he said. Anuradhapura and Pollonnaruwa districts in the North Central Province (NCP) have the bulk of the patients with 9005 and 4369 respectively. Kurunegala, Matale and Vavunia have over 1000 cases. President Sirisena is particularly concerned about CKDu because he hails from NCP. Looking at the disease from a people’s representative, Sirisena said that given the disability and the economic impact of CKDu on the farmer and his indigent family, those involved in prevention, treatment and care, should look at the impact of the disease on the family of the patients and alleviate the suffering of the family. This is why under the national program, houses, educational scholarships and aid for self employment are given to the families of those who had died of kidney disease, he said. Sirisena praised Sri Lankan doctors and health personnel for the commitment with which they are executing the national program but added that much more needs to be done to prevent the disease and meet the needs of the suffering patients and their families. Dr.Chula Herath ,President of the Sri Lanka Association of Nephrologists, said that Sri Lanka has come a long way since the 1980s when there were only two nephrologists in the country. Now there are many and 350 transplants are done every year. But the area in which the country is weak is prevention and locating the cause of the disease. Renowned Indian nephrologist Prof.Georgi Abraham of the Madras Medical Mission told Express that CKDu is more of a problem in Sri Lanka than it is in India, but the silver lining in Sri Lanka is that there is a national program to combat it, which is not the case in India, except in Tamil Nadu, where there is a Chief Minister’s scheme. The problem areas in India are Srikakulam and the East Coast of Andhra Pradesh and Goa. “The Chennai-based TANKER Foundation in association with Thomas Cooke is working in Srikakulam” Dr.Abraham said.